The Equate VibraClean Pulsating Soft Power Toothbrush combines the cleaning action of electric toothbrushes and the convenient, disposable style of a manual toothbrush. This electric toothbrush system features two cleaning motions: vibration and pulsation. The brush vibrates to penetrate deep between teeth and the pulsating action loosens food particles and plaque while gently massaging and stimulating gums. These features are usually found on top-rated electric toothbrushes, not disposable brushes! Each package comes with two toothbrushes with non-replaceable batteries. Take your oral care to the next level with the Equate VibraClean Pulsating Soft Power Toothbrush. Making the right health decisions can be challenging. With a complete range of products and simple solutions, Equate allows you to take care of your family with confidence. Instructions: Dentists recommend replacing brush head every 3 months for optimal brushing performance. Replace sooner if brush head becomes loose due to damage. Rinse bristles after each use. The Equate VibraClean Pulsating Soft Power Toothbrush is the lightweight (about 2 oz.) disposable electric toothbrush that provides the penetrating cleaning of a battery-operated toothbrush, without ever changing batteries. This toothbrush provides a better cleaning than a manual toothbrush, but you can dispose of it once the batteries run out. How is this? They come with an integrated battery and once it has reached its cycle, you just dispose of it. The toothbrush vibrates to penetrate deep in between teeth and pulsates to lose the food particles and plaque while it massages the gums. Great for home use or travel. It comes in a handy two pack: one for home and the other for travel. Much better than a regular tootbrush. I am happy to see Equate make a pulsating/vibrating toothbrush. I have been use the ones that Colgate makes for years. And, it is wonderful to have a cheaper alternative. I also like that the Equate brand comes in a two pack. You can never have too many toothbrushes. This toothbrush does the job at cleaning your teeth just as well as any more expensive brand that work the same way. For those of you that have never used a pulsating/vibrating toothbrush, you should try it today. 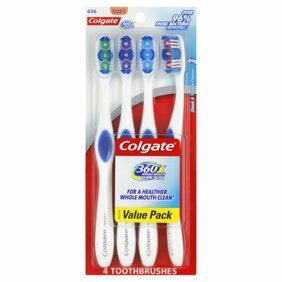 I my opinion this gives more brushing action to wiggle around and get all of the corners of your teeth and mouth clean. Far better than just using your hand to wiggle the toothbrush around. The only difference I see between the Equate and more expensive brands, the batteries in the Equate are not replaceable. Which is not a bad thing. Because, you are supposed to replace your toothbrush every three months. I received this Equate VibraClean Pulsating Soft Power Toothbrush in exchange of an honest review. This power toothbrush are very affordable and get the job well done. Even though they may look simple or for kids looking toothbrush they are perfectly well for adults. They brushed your teeth very good. I honestly dont recomend this for kids. Maybe for teens but not for kids under 7. The bristles may hurt their teeth. It comes with 2 power toothbrush . One blue and a pink one. Like for your daughter and son. Or maybe for the mom and dad. They come with and off and on buttons. Not like some power toothbrush you have to hold on the power button in order to work. . You one it on , leave it on. Once you're done just turn it off. On the blue toothbrush the bristles are blue and white. Very soft bristles. The pink power toothbrush the same pink and white bristles also very soft. The are also travel size. Which is very convenient. Even though some power toothbrush work in circle motion not this ones. This ones are more like vibrations . Which it helps a lot to remove the food stuck between my teeth. This power toothbrushes are disposable too. I believe they are at a very good price for the wonders that it does on your teeth. I recomend this Equate VibraClean Pulsating Soft Power Toothbrush, 2 Count to everyone . You wont regret. Feels good to use it gets the job done and at a very affordable prices. This two that I received are , one for me the other one for my husband . I have order a few more for my son. Leaves teeth feeling vibrantly clean! I've never been a big fan of battery powered toothbrushes. Too big, too unwieldy, too expensive, too many attachments to worry about, and batteries that need to be replaced a little too often. Luckily, the Equal VibraClean Pulsating Soft Power Toothbrush is none of those things. It's small and sleekly designed, easy to operate, extremely portable, affordable, and easy to replace. Best of all, it comes in a 2-pack, so you really get your money's worth. This toothbrush vibrates to penetrate deeply between teeth and pulsates to loosen food particles and plaque. It has soft nylon bristles that are gentle even on sensitive teeth and rubber bristles that gently massage and stimulate gums. You just turn the toothbrush on and brush like you normally would. No need to worry about oscillating heads or crazy attachments. Each brush comes with one non-replaceable battery already installed and is fully disposable, meaning you just tossed the toothbrush in the trash when it's time to change it - no muss, no fuss. It really is that simple to use and it leaves my teeth feeling vibrantly clean. The color scheme is also very pleasing to the eye. What more could a busy gal like me ask for? 1. The Equate Battery Operated Toothbrushes Soft 2 count are fully disposable, it contains non-replaceable battery and opening the handle will destroy the product. Where can I buy replacement heads for equate battery toothbrush? 1. You can't. That's why its disposal. Can you replace the battery? If so, how?